My move-in day at Northwestern was filled with unexpected surprises. I had packed up my entire life and road tripped up from Florida, frantically texting everyone I knew on-campus to try and get my bearings. The process of starting the next chapter of your life has the potential to be absolutely terrifying; I’m so lucky that Northwestern turned out to have one of the best systems for supporting its new students and transfers. 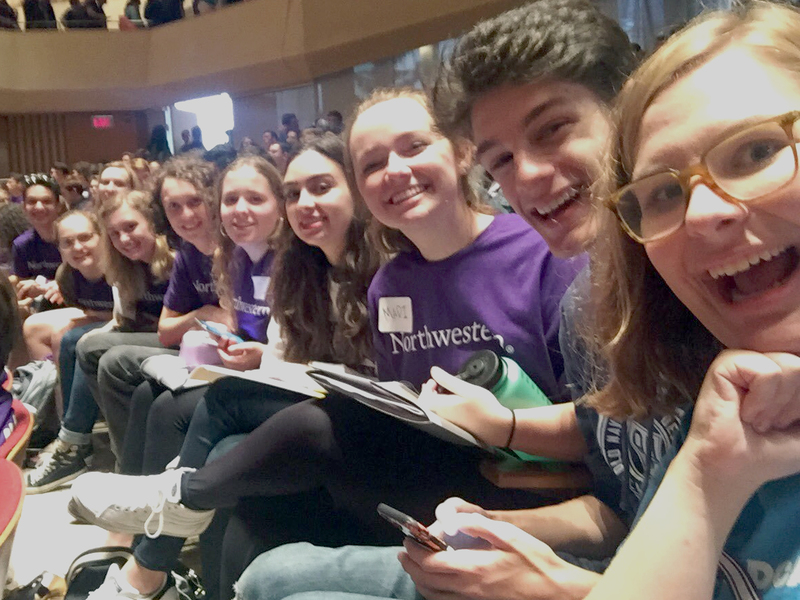 Northwestern is incredibly unique when it comes to orientation. Rather than give you a few days over the summer to find your dorm and register for classes, the Quarter System allowed us an entire week of guidance, seminars, and advising to get us over that first hurdle before classes start. We were running around from sun-up to sundown and beyond, but the support was absolutely stellar. Groups of ten two to twelve students – divided by school and academic interests – were paired with a mentor to guide and assist. This system of peer adviser (PA) and peer group was better than I ever could have hoped. The biggest fear I had when coming to Northwestern was how to socialize. We all come from such different backgrounds and experiences and college isn’t like high school, where you largely took classes with the same students. As a theatre major on campus for the first time, my PA group was all people with the same love for the art. We met at March to the Arch, had some quick introductions, and hit the ground running. The ten of us went from our School of Communication advising to a quick lunch to a tour of the campus at breakneck speeds. There was no need to worry about being swept away by it all because you had people there, keeping you grounded and making the experience enjoyable. It was so easy to talk to them about theatre, Wildcat Welcome, where to eat. We learned so much about each other in that week: from Sophie, who lived in Evanston most her life, to Alexa, whose parent hailed from Cyprus. Emma had taken a gap year to travel the world; she went to Belize and fostered a howler monkey with WildTracks. Liza, our PA and a third-year student, was a beacon of love and emotional support. We tied ourselves together in a human knot, did some sick zombie breakdancing, and I found friends I never want to forget. I’m so thankful for my PA group and my PA. Wildcat Welcome is a lot of information and a lot of people talking at you; your PA group is always there to talk with you. We laughed together when we shared our biggest mistakes on-stage; we were there for each other when we shared who we had to leave behind. It turns out I had nothing to worry about when it came to being social; it happens so naturally when all of us were in our first week of college and all of us had no idea what to do just yet. At the end of the day, that big 8000+ undergrad statistic is just a huge melting pot of over 500 diﬀerent student groups, more than 100 different academic paths, and so much more. The best advice I can give for the adjustment to living as a small ﬁsh in a big pond is simply to make your pond smaller. You start oﬀ the right way – with a close-knit PA group – for a reason! And, if you happen to name your PA group after a baby monkey named Puck, just go with the ﬂow.